art for creating the illusion of depth. Foreshortening is a kind of perspective. Artists also represent single figures in space in varying ways. 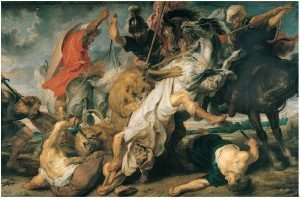 When the Flemish artist Peter PaulrubenS (1577–1640) painted Lion Hunt (fig. 1), he used foreshortening for all the hunters and animals—that is, he represented their bodies at angles to the picture plane. When in life one views a figure at an angle, the body appears to contract as it extends back in space. Foreshortening is a kind of perspective. It produces the illusion that one part of the body is farther away than another, even though all the forms are on the same surface. Especially noteworthy in Lion Hunt are the gray horse at the left, seen from behind with the bottom of its left rear hoof facing viewers and most of its head hidden by its rider’s shield, and the fallen hunter at the painting’s lower right corner, whose barely visible legs and feet recede into the distance. foreshortening. That artist’s purpose was to present the various human body parts as clearly as possible, without overlapping. The lower part of Hesire’s body is in profile to give the most complete view of the legs, with both the heels and toes of the feet visible. The frontal torso, however, allows viewers to see its full shape, including both shoulders, equal in size, as in nature. (Compare the shoulders of the hunter on the gray horse or those of the fallen hunter in Lion Hunt’s left foreground.) The result, an “unnatural” 90-degree twist at the waist, provides a precise picture of human body parts. Rubens and the Egyptian sculptor used very different means of depicting forms in space. Once again, neither is the “correct” manner. Proportion concerns the relationships (in terms of size) of the parts of persons, buildings, or objects. People can judge “correct proportions” intuitively (“That statue’s head seems the right size for the body.”). Or proportion can be a mathematical relationship between the size of one part of an artwork or building and the other parts within the work. Proportion in art implies using a module, or basic unit of measure. When an artist or architect uses a formal system of proportions, all parts of a building, body, or other entity will be fractions or multiples of the module. A module might be the diameter of a column, the height of a human head, or any other component whose dimensions can be multiplied or divided to determine the size of the work’s other parts. In certain times and places, artists have used canons, or systems, of “correct” or “ideal” proportions for representing human figures, constituent parts of buildings, and so forth. In ancient Greece, many sculptors formulated canons of proportions so strict and all-encompassing that they calculated the size of every body part in advance, even the fingers and toes, according to mathematical ratios. Proportional systems can differ sharply from period to period, culture to culture, and artist to artist. Part of the task art history students face is to perceive and adjust to these differences. In fact, many artists have used disproportion and distortion deliberately for expressive effect. dürer’s death (fig. i-7) has hardly any flesh on his bones, and his limbs are distorted and stretched. disproportion and distortion distinguish him from all the other figures in the work, precisely as the artist intended. 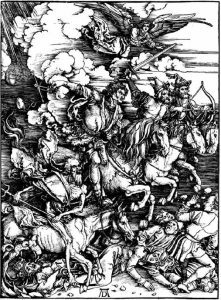 Fig 3 albrecht Dürer, The Four Horsemen of the Apocalypse, ca. 1498. Woodcut, 1′ 3 1–4 ″ × 11″. Metropolitan Museum of Art, New York (gift of Junius S. Morgan, 1919). enlarging of elements considered the most important. On the bronze plaque from Benin, Nigeria, illustrated here (fig. 3), the sculptor enlarged all the heads for emphasis and also varied the size of each figure according to the person’s social status. Central, largest, and therefore most important is the Benin king, mounted on horseback. The horse has been a symbol of power and wealth in many societies from prehistory to the present. That the Benin king is disproportionately larger than his horse, contrary to nature, further aggrandizes him. Two large attendants fan the king. Other figures of smaller size and lower status at the Benin court stand on the king’s left and right and in the plaque’s upper corners. One tiny figure next to the horse is almost hidden from view beneath the king’s feet. the lower left or right corner of each illustration.